Witches, bats, and black cats don’t usually come to mind when you think of Biltmore, but deep in the basement of America’s largest home, there’s a cavernous room with brick walls painted in brightly-colored murals depicting such creatures. The paintings include characters from folklore, a platoon of wooden soldiers, and other imaginative imagery that eventually caused this area to be dubbed The Halloween Room. 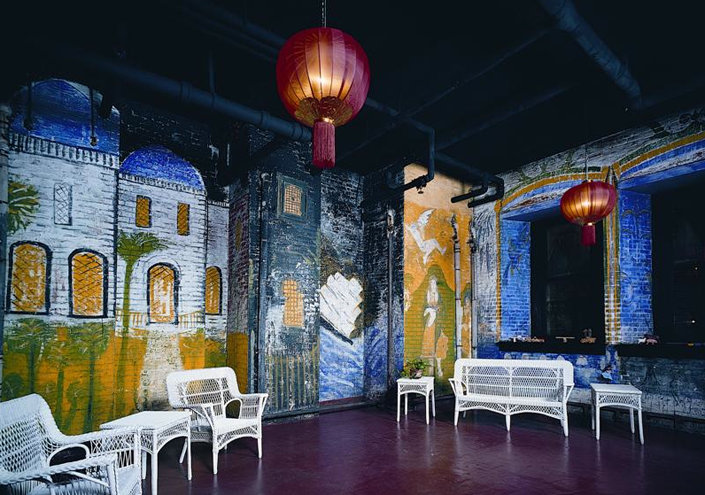 For many years, the colorful murals remained a bit of a mystery, with some thought that the room was the scene of a 1920s Halloween weekend house party during which guests of John and Cornelia Cecil were invited make their mark on the walls. Subsequent research revealed, however, that the paintings were created in December 1925 to prepare the room for a New Year's Eve celebration--but that still didn't explain the slightly eerie tone of the murals. Leslie Klingner, Curator of Interpretation, recently discovered an obscure connection between the scenes on the walls and an avant-garde Russian cabaret and theatrical troupe called La Chauve-Souris, which translates to The Bat. The troupe toured America in the 1920s, performing on Broadway in 1922 and again in 1925. The vaudevillian comedic acts were set off by abstract sets designed by two Russian artists, Sergei Sudeikin and Nicolai Remisoff. The show met with great success, triggering a rage for all things Russian in New York City and beyond. The Cecils must have been fans of the cabaret as they and their friends created their own version of La Chauve-Souris on the basement walls of Biltmore House. Most of the murals were drawn directly from Remisoff and Sudeikin’s illustrations for the theatrical program. After three weeks of painting, the Cecils hosted a gypsy-themed ball on December 30, 1925, as part of their New Year’s celebration. "The best party I have ever attended"
Originally designed for storage, The Halloween Room now showcases an exhibition of historic photographs documenting the construction of Biltmore House in the 1890s. I thought the same thing, initially, looking at the plans, that's weird that there's a 'gymnasium lounging room' with no gymnasium. (And that there's only a walkway on one side of the pool.) But from pictures, it seems that the 'lounging area' is really a tiled gym. Are you sure this room was intended for storage? After studying the floor plans, I'm almost convinced that it was a gymnasium.There is a Gymnasium Lounging Room. But no gymnasium. The swimming pool has dressing rooms for both men and women but the gym lounge only has men's dressing rooms and a corridor leading to the Halloween Room which is the only room large enough to house a gym. At the time this place was built, it was acceptable for women to swim but not necessarily to use a gym.